Michael Harold, chairman of the Department of Chemical and Biomolecular Engineering, will lead a $2.1 million project to find new catalytic materials for a more efficient engine. But the next-generation engine requires a next-generation catalytic converter to reduce harmful emissions of pollutants including nitrogen oxide, carbon monoxide and volatile organic compounds. So far, that has remained elusive. A chemical engineer from the University of Houston will lead a $2.1 million project to find new catalytic materials that work at low exhaust temperatures, allowing automakers to build vehicles that operate more efficiently while retaining the ability to clean emissions before they leave the tailpipe. Michael Harold, chairman of the Department of Chemical and Biomolecular Engineering at UH, will serve as principal investigator on the grant, funded by the U.S. Department of Energy National Energy Technology Laboratory (DOE NETL). The project also includes researchers from the University of Virginia (UVA), Oak Ridge National Laboratory (ORNL) and Southwest Research Institute (SwRI). Engineers from Fiat-Chrysler Automobiles Inc. and Johnson Matthey Inc. also will be involved in the project. Catalytic converters clean vehicle exhaust into nitrogen, water and carbon dioxide. While carbon dioxide contributes to global warming, it is considered less damaging to health than raw automotive emissions. Current catalytic converters use precious metals, including platinum and palladium, to eliminate the main pollutants emitted by internal combustion engines. The new engines, based on a lean burn, compression ignition technology, can’t be commercialized without a way to ensure they run cleanly to meet emission rules. Although the conventional three-way catalytic converter doesn’t work for the new engines, Harold said the new converters might be transferrable to current vehicles. Harold, a catalytic reaction engineer, and Lars Grabow, associate professor of chemical and biomolecular engineering at UH who works in fundamental catalysis, will work to discover and determine the effectiveness of new catalytic materials, working both with a class of known materials and developing new ones. 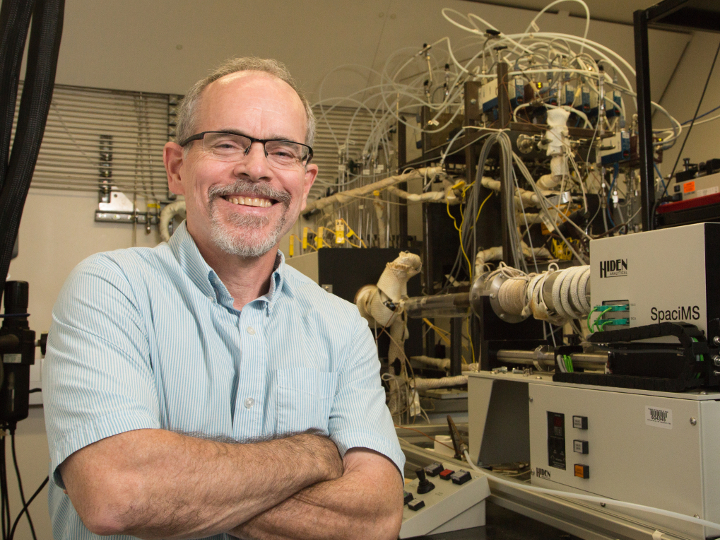 Researchers at UVA will conduct high throughput materials synthesis and screening, ORNL researchers will contribute in materials synthesis and characterization and SwRI will provide evaluation of fuels. Fiat-Crysler and Johnson Matthey will bring their industrial expertise in vehicles and catalysts, respectively.